100 Songs By Artists To Discover At SXSW 2015 View a list of 100 songs by artists to discover at the 2015 SXSW Music Festival. Emma-Lee Moss, a.k.a. 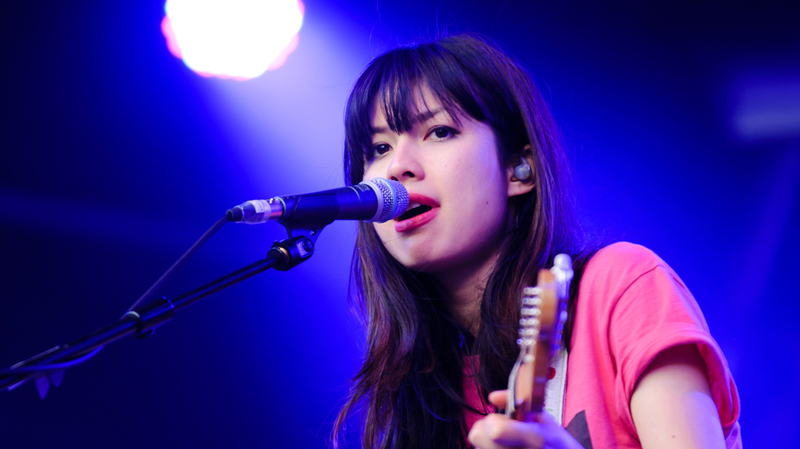 Emmy The Great. These songs are no longer available for download. There's a lot of music on this page — 100 songs, to be exact, each from an artist worth discovering at this year's SXSW Music Festival. It represents more than six genre-defying hours of music. Still, we started out with far more to choose from. It took an enormous amount of effort to get here: Thousands of acts play SXSW each year, enough that winnowing them down to 100 required months of seeking, listening, culling and decision-making. What remains are some of SXSW 2015's most thrilling discoveries and highlights. In addition to this list, we've also got a full, interactive multimedia experience — not to mention a way to stream these songs all the way through SXSW 2016. And, as always, visit NPR.org/SXSW for live concerts, photos, videos and dispatches from this year's festival. Amber London, "Strikkly 4 My Sippaz Freestyle"
Bell Gardens, "Darker Side Of Sunshine"
Big Phony, "I Love Lucy"
Boogie, "Bitter Raps (prod. DK The Punisher)"
Chancha Via Circuito, "Jardines (feat. Lido Pimienta)"
Charlie Belle, "Get To Know"
Chastity Belt, "Time To Go Home"
Count This Penny, "Shoebox Scene"
Emmy The Great, "Swimming Pool"
The Family Crest, "Beneath The Brine"
Fatherson, "I Like Not Knowing"
Field Mouse, "Everyone But You"
Hanne Kolstø, "We Don't See Ourselves"
Happyness, "Anything I Do Is All Right"
Joan Shelley, "First Of August"
Josh Berwanger Band, "I Want You Bad"
Jukebox The Ghost, "The Great Unknown"
Kaleo, "All The Pretty Girls"
Kevin Devine & The Goddamn Band, "Bubblegum"
Knox Hamilton, "Work It Out"
Kristin Diable, "Time Will Wait"
The Lees Of Memory, "We Are Siamese"
Lowell, "I Love You Money"
Max Capote, "Sin Mentirte (feat. Sie7e)"
Meg Mac, "Roll Up Your Sleeves"
ODESZA, "Say My Name (feat. Zyra)"
Quiet Company, "Understand The Problem"
Scotty ATL, "Cloud IX (Go Up!) [prod. DJ Toomp]"
Sheer Mag, "What You Want"
Summer Heart, "Thinkin Of U"
THEESatisfaction, "EarthEE (feat. Shabazz Palaces, Porter Ray & Erik Blood)"
Twin Shadow, "Turn Me Up"
Venomous Maximus, "Give Up The Witch"
Your Old Droog, "Bad To The Bone (Remix)"